This morning I discovered that Bunny was having trouble breathing. She seemed to go into a coughing fit every so often, waking herself up while she pathetically squeaked and wheezed her way around her bed. When I held her, I felt a rattling in her ribcage and she seemed disoriented. I took her to Michael for a second opinion, and he agreed that this was highly concerning. I sent him some information I had about nearby vets that serve hamsters, he called and we explained our situation, and.... waited. With all of the Korean I have been learning, nothing I've learned so far has fallen under the "possibly emergency vet visit for my hamster." Fortunately the receptionist spoke some English and was able to let us know that the English speaking vet would be in and available at 1:30. At that time, it was 9:48 AM. The waiting was horrid. I've known that there are aspects of Diana's last days that I haven't fully confronted, and today a lot of that was thrown into the limelight. I delegated a lot of communicating to Michael, as I did not trust my own ability to hold it together. My brain picked out and fabricated too many similarities between Bunny and Diana, and I found myself looking for distractions via games and books. By the time I loaded Bunny into her travel cage, she seemed miles better. A lot of the extreme wheezing had gone away and she no longer seemed confused. Michael and I still decided to take her in, partially for peace of mind and partially because she still periodically wheezed and squeaked at us. The drive to the vet felt longer than the 20 minutes it took to get there. While Michael drove, I kept an eye on Bunny to make sure she wasn't showing any signs of extreme agitation. At one point I opened the top to try and help her find a chew toy I had given her. Instead she crawled up my hand and tried to escape into the car. Silly Bunny, you can't do that. The visit to the vet was easy and fairly painless. As we were foreigners, it wasn't that hard for the receptionist to place us as the worried hamster owners from the phone. We checked in and had some time to see what hamster goodies this vet had to offer. The vet himself was a very nice man. He was patient with explaining what he was doing, what he saw, and how he felt about what he saw. He complimented Bunny's teeth and nails, saying they were a healthy length. She seemed a healthy weight as well - 167g, which is right around the measurements I have for her. He didn't find anything that concerned him besides some nasal discharge, but he took some x-rays to be sure. That's right. Michael and I paid for little Bunny to get some x-rays. While we waited for her to finish up her x-rays, I mentioned to Michael that I never wanted to be in the position I was in with Diana ever again. With Diana, I had to make decisions based off our bank account. We had no credit or savings to pull from, and the meager amount we did have was almost zeroed out in trying to care for Diana. To this day I carry the guilt of knowing that my opting out of those extra diagnostic exams prevented us from catching her tumor and cost us her life. Here we had the luxury of knowing that we could do it, whatever "it" was. The x-rays turned out completely normal, besides some intestinal gas pockets that the vet said he could give Bunny an injection for but if left alone would most likely only cause diarrhea. Final verdict: two shots and a week's worth of medicine for an upper respiratory infection. It was heartbreaking being in the room for Bunny's two shots. I now know what her squeaks of pain and discomfort sound like, though. Through all of this, she never retaliated or bit anyone. She is such a wonderful little hamster. We brought Bunny home and let her sleep off the traumatic experiences of the day. I gave her the first dose of medicine a little while ago, and it was an ordeal. I was too slow in syringing the liquid into her mouth, and the medicine goes from sweet to very bitter in a short period of time. The end result was Michael trying to hold her in place while I tried to get her to take the last bit of medicine. It was almost funny seeing how she would grab the syringe and hold it away from her face while she looked away. Even with the vet's assurances that she would be okay and seeing her x-rays with my own eyes, I couldn't shake my feeling of unease. It took a long talk with myself to realize why: the last time a vet told me everything would be okay my pet died. Even though I do not blame them, as she showed no indication that told us she needed further diagnostic exams, it has rooted a seed of fear. That is my problem and my battle, however, and if there's one thing I've learned, it's that trudging through the mud is the best way for me to confront my demons and move on. 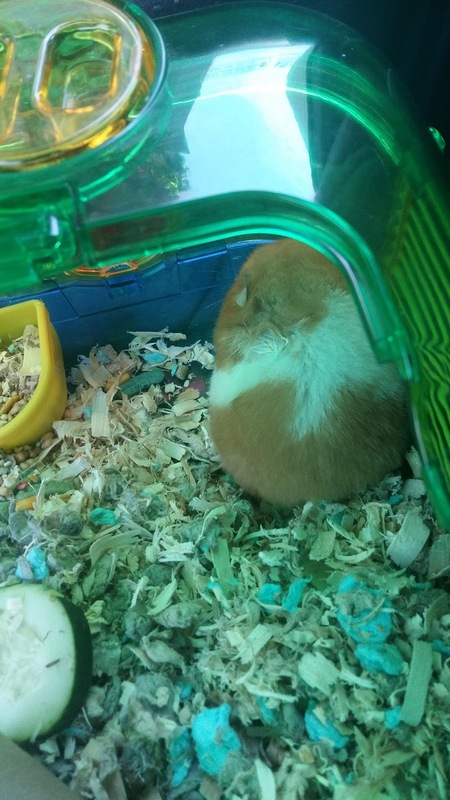 A few days after we picked up the hamsters, I went through a period of panic. I realized that having the hamsters meant they would inevitably die in my care, and I feared that I wouldn't be equipped to handle it when it happened. In my tear-filled angst, I expressed regret about taking them on. Today those same fears took root, but instead of regret at owning these little balls of fluff, I just felt a weird combination of happiness and sadness. Sadness at the thought of losing Bunny, but happiness that I knew we had given her the best quality of life we could possible and that the Bunny I had today was miles happier and healthier than the Bunny of one year ago. Regret was nowhere to be found. That's growth, isn't it? I didn't mean for this blog to become so... real. As I began blogging about my adventures in Korea, however, I realized that I was also documenting my personal growth. I'm pretty young within my blogging group, and I'm still in a period of major growth. Looking back at my posts from just a year ago reveal a different Liz from the person I am today. So I'm okay with a little less than rainbows and sunshine on my little corner of the internet. Just so long as I don't get stuck in the mud. Outside of today's activities there are a lot of other, happier things that have happened that I haven't gotten around to posting about. We saw Guardians of the Galaxy 2 with C & J. Good movie. I greatly appreciated Pratt's acting during that moment. I found some dirt for the hamsters' homes. No, that didn't contribute to Bunny's illness, and yes, they absolutely love it. They dig around in the dirt all the time. I've read several books. I've started working on reviews to post on the blog, but I want to sit on a few of the books before I write about them. There's a lot of emotion I don't know how to convey. I finally got around to folding all of the clothes I failed to fold while we were watching Nala. As much as we miss her and as empty as the house feels, I do not miss the dog hair. I can't miss it; it keeps showing up in all the little nooks and crannies no matter how often I sweep and mop. LOL! Wax and other things I normally blog about have been set on the back burner. I'm in the middle of a job hunt, as this was my last semester of school and, barring any sudden "You fail!" declarations, I shall be a graduate as of the 20th back in the States. I don't know how to feel about all of this. I've been in school for so long that I don't know what it's like to not be in school, and if anything I feel apprehension at the uncertainty of life beyond school. Yay adulthood, I guess? Tell me how things have been going in your corner of the world! Are you partaking in the SMT opening this weekend? You are a great hamster mom and your concerns and care for Bunny touches my heart! I'm glad her issue doesn't seem too serious. Congrats on your upcoming graduation; what an accomplishment! I have two friends that are also serial students who are also graduating and they are so glad to be done. One already has a job but the other is in the job hunting process like yourself. A new job!!! I will be sending you good thoughts and wishes for one you will enjoy. And congrats on graduating. That is huge! So proud of you. What were you going to school specifically for? Looking forward to your book reviews. Glad Bunny is OK. My son is wanting to get a hamster, something I've been putting off since we have three cats, and I would hate to have something bad happen. Being a pet mom is always hard, knowing that their lifespan can't match our own. But the amount of love given over the years far outweighs the pain in the end. My baby cat is 11 now, so I've been thinking about that more and more. It is hard to know what to do, even when money isn't an issue. There is just no way to explain chemo to a cat. So either way, the decision is always filled with "what if..."
Guardians 2 was awesome - I want to go see it again. Good luck with the job search! Oh my, absolutely nothing makes the heart drop into one's stomach faster than a suddenly sick pet. I would have been just as panicked. So relieved Bunny is better. For whatever reason, sometimes your posts bring up personal emotional aspects from my life that I don't admit anywhere else. I know the haunting feeling of guilt over a pet's death, luckily one I haven't felt in nearly 17 years, yet resurfaced the other night as I was half asleep causing near anxiety attack levels. I repeat 17 years, but when you keep feelings repressed they can surge up powerfully. I hope you are reassured in your actions and care of your hamsters. Also, please reach out if treatment is unable to occur for any reason and let me know if there's anything I can do to try and help. Congrats on graduating and welcome to adulthood, I'd be a life-long student if I could.